4th (King's Own) Regt. of Foot at Waterloo 2015, formed up on the Mont St. Jean Ridge in front of the spectator stands. 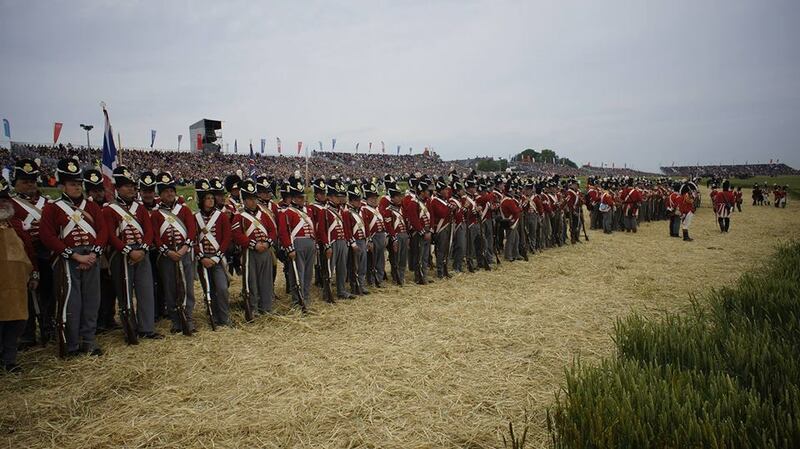 Our original aim was to be at the Waterloo 200th Anniversary re-enactment in 2015. We got there and it was worth all the drill, expense and time to be there - especially with an international crowd of over 60,000 watching us on both evenings! It was particularly enjoyable to join with our American colleagues to form five sections of the 2nd Brigade. Highlights included putting the French Middle Guard to flight and soaking up the atmosphere, imagining who stood where we were 200 years previously. Below is a list of Officers, NCO’s and Rank & File who were present in the actions of the 18th, 19th and 20th June 2015 for the re-enactment of the Battle of Waterloo. The names of those killed, wounded or missing are marked (k), (w), and (m) respectively. SERJEANTS - C. Johnson; B. Sporne; S. White. CORPORALS - R. Bemis; K. Brown; P. Green; S. McLaughlin; W. Morys-Carter; T. Small; C. Woolf. KINGSMEN – N. Baker; R. Balcius; N. Barlow; A. Bateman; A. Bennie; C. Bennie; D. Bird; C. Carter, (w); T. Clarke; A. Cropper; J. Dacombe; N. Dalrymple; J. Daniels; S. Davies; P. Davies; R. Edwards; N. Fothergill; B. Goodridge; K. Gatlin; M. Hagenbach; P. Hillman; A. Holt; P. Hubble; P. Hurcombe; B. Ingham, (w); J. Kahler; G. Langhorne; M. McComas; J. McGarvey; B. Megee; M. Morys-Carter (w); K. Mounter; C. Nohr; O. Nohr; R. Nohr; M. Pace; D. Psyshora (w); S. Roberts; C. Rogers; M. Stockley; G. Walling; C. Wooly. M Young. The long and illustrious history of the 4th (King's Own) and in particular their involvement in American Revolutionary War and War of 1812 means there are number of groups worldwide representing various periods of the regiments' history. We were fortunate that several of our American cousins joined us for Waterloo 2015.